your card is shipped FREE of charge. You may purchase your 2015 card using the Buy Now link below. You will be directed to the secure servers at Paypal. Help In a rush to get your card? Leaving for the beach tomorrow? No problem, we have a couple of ways to get your card to you quickly. Mail or drop off directly to your hotel/resort - we would need the name and address of your hotel/resort, name under which the reservation was made, and arrival date. Your card will be waiting for you at the front desk upon check-in. Mutual location pick-up - we can meet up at a mutual location for card pick-up. On the Paypal order form, find the Messages box. Please note any special instructions in that box. would like to support with your card payment. 7D Cinema Experience Discount: Buy one admission and get the second free. Valid for the card-holder and up to 3 guests. Backstage Mirror Maze & Laser Maze Discount: Buy one VIP Admission and get the second for half price. Valid for the card-holder and all guests. Black River Outdoors Center Discount: $5 off a 2-hour tour; $7 off a 4-hour tour; $9 off a 6-hour tour. Valid for your entire group. Bodacious Bob's Beach Bicycle Tours Discount: 15% discount on all bike rentals and guided and self-guided tours. Bulldog Tours Discount (Ghost and Graveyard, Ghost and Dungeon, Dark Side, and Haunted Jail Tour): $3 discount on each tour. Good for the cardholder and up to 5 guests. Calabash Fishing Fleet Discount: Buy one half day or night fishing, dolphin, or sunset waterway cruise At regular price and get one at half price. Valid for your entire group. Cap'n Rods Lowcountry Tours Discount: Buy one tour ticket and get the second half price. One half price ticket per card per day. Captain Jims River Tours Discount: $5 discount per coupon on the 90-minute cruise. Children's Museum of South Carolina Discount: $3 discount on admission. Good for the cardholder and up to 3 guests. Family Kingdom Amusement Park Discount: $3 discount on an all ride wristband (excludes go karts, zipline, and water park). Good for up to 6 people. Family Kingdom Water Park Discount: $2 discount on an all day waterpark wristband. Good for up to 6 people. Ghost Walk of Wilmington Discount: Buy three tickets, get one free. Hopsewee Plantation Discount: Buy one adult admission, get one half price. Good for the cardholder and up to 5 guests. Ingram Planetarium Discount: $2 discount on admission. Good for the cardholder and up to 3 guests. Inlet Point Plantation Stables Discount: $10 per person discount on a sunset beach ride. Kaminski House Museum Discount: Buy one admission, get one free. Good for your entire group. Little River Bowling Discount: Buy one game, get one free. Good for your entire group; Buy one pizza, get one free. Little River Fishing Fleet Discount: $5 per person discount on any half day fishing trip. Mirror Maze & The Vault Laser Beam Challenge Discount: Get a $2 per person discount for either the Mirror Maze or Laser Beam Challenge or a $2 discount on a Combination Ticket. Good for the cardholder and guests. Myrtle Beach Pelicans Discount: Two-for-one Grand Strand Reserved or Reserved Box Tickets (limit one free ticket per group). Excludes opening day, holiday games, and playoff games. Myrtle Beach Segway Discount: Buy one tour or hourly rental and get a second at half price. good for up to 8 people. Myrtle Beach Speedway Discount: NASCAR Whelen (all races) - $2 discount per ticket. Kids 12 & under free; Wheels Of Destruction - $3 discount per ticket.Both discounts are valid for the cardholder and up to 5 Guests but cannot be combined with any other offers or discounts. NASCAR Racing Experience Discount: $5 off a NASCAR ride; $25 off a NASCAR drive. Good for the cardholder and up to 2 guests. Pirate Adventures Discount: Ages 3 and up get a $6 per person discount on the regular price of $25. Valid for the card-holder and family. Ripley's Discount: $3 discount on an adult admission; $2 discount on a child admission. Good at all 5 Ripley's attractions for the cardholder and up to 5 guests. Runaway Bay Mini Golf Discount: Buy one round of golf, get one free (before 6:00 p.m.); Get a double scoop of ice cream for the price of a single. Good for the cardholder and up to 3 guests. Soar and Explore Discount: $2.50 discount on an adventure combo (excludes adrenaline combo). Good for up to 6 people. Surf's Up Family Fun Center Discount: 10% discount on any activity. Surfside Bowling Lanes Discount: Buy one game of open bowling, get one free. Good for your entire group; Buy one pizza, get one free. Tribal Island Mini Golf Discount: Buy one round of golf, get one free (before 6:00 p.m. Good for the cardholder and up to 3 guests. Voyager Fishing and Dolphin Cruises Discount: $4 off per adult for a half day fishing trip; $5 off per adult for a dolphin cruise; $6 off per adult for a gulf stream fishing trip. Valid for your entire group. Waccamaw Bowling Discount: Buy one game of bowling, get one free (excludes Glow-n-Bowl); buy one pizza, get one half price. Wallace Sailing Charters Discount: Book a two hour or longer cruise and get one hour free ($125 savings). Anthony's Pizza and Pasta Discount: Buy 1 Large one or more Topping Pizza and get a 2nd Large one Topping Pizza Free. Eat in or take-out only. Not available for delivery. Anything Eatz Goz Froz Discount: 20% discount on all food. Anything Froz Frozen Yogurt Discount: 20% discount on your entire check. Arby's (multiple locations): 10% discount on your order, excluding value meals. Back Deck Bar & Grill: Buy any Burger, Sandwich or Wrap and get the 2nd of equal or lesser value at Half Price. The Bagel Factory - Buy 1 Breakfast Bagel Sandwich and 2 beverages, get 1 Breakfast Bagel Sandwich of equal or lesser value Free. Buy 2 Lunch Bagel Sandwiches and 2 beverages, get 1 Lunch Bagel Sandwich of equal or lesser value Free. Bar-B-Que House Oak Island Discount: Buy one menu item, get a second at half price. BarBQue House North Myrtle Beach Discount: Buy one menu item, get a second at half price. Bar-B-Que House Surfside Discount: Buy one menu item, get a second at half price. Barking Fish Yogurt Discount: Buy one 8 oz. or more yogurt and get a second for half price. Valid for the cardholder and 3 guests. Barons Discount: $10 discount on a purchase of $50 or more. Beaver Bar Discount: $2 instant rebate on any purchase;$5 instant rebate on any purchase of $25 or more;$10 instant rebate on any purchase of $50 or more. Not valid for nightly specials. One instant rebate per order per card. Rebates may not be combined with any other offer. Beer 30 Bar & Grill: 25 cents off your drink of choice all day every day. Bellagio's Cafe & Grill - Buy 1 Entree' Get 1 of equal or lesser value Free. Valid for 4 people. Big E's Seafood & Country Buffet Discount: Buy one lunch or dinner buffet, get the second for half price. Bliss Restaurant Discount: 15% discount on food items. Boardwalk Billy's - Buy one and receive the 2nd of equal or lesser value for half price. Valid after Memorial Day until the day before Labor Day. Valid for the Card-holder and Guest. Labor Day through Memorial Day receive 10% Off your check excluding beverages. Valid for the check. Not valid for Happy Hour pricing. Boathouse Waterway Bar - Sept 2013 - April 2015 and Sept 2015 - Dec 2015 Buy 1 lunch or dinner and get a 2nd Free of equal or lesser value. May - August 2015 Buy 1 lunch or dinner and get a 2nd of equal or lesser value at Half Price. Not to be combined with any other offer or Specials such as Sunday Fun Day. Borgata Bar Discount: $10 discount on any check over $25 that includes food. Boston Pizza Discount: Buy any pizza and get an 18inch cheese pizza for $6.50 (take out only); Dine in and get 10% off your check. The Brentwood Restaurant - Buy one Entree and get Half Off a 2nd Entree up to $12 off. Not to be combined with any other offers, Special Menu or on Holidays. Burger Bar & Beach Club - Buy any menu item and receive the 2nd of equal or lesser value at Half Price. Capt'n Seaweeds Discount: Buy one lunch or dinner, get the second for half price. Carlos'n Charlie's Discount: Free House Appetizer (one per table of four). Not to be combined with any other offer or special. Carolina Wings & Ribhouse Conway Discount: Buy one lunch or dinner, get the second for half price. Cheesesteak U - Buy one get one Half Price, valid for up to 3 half price meals per visit. Chili's Myrtle Beach Discount: Free chips & queso with the purchase of one or more entrees. Chloes Cafe Discount: Buy one Breakfast or Lunch Entree and get a 2nd of equal or lesser value at Half Price. Christopher's Pizza Discount: Buy a large pizza with one or more toppings and get free cheesy bread sticks. ($6.50 value). Coppers Restaurant - Receive a Free Appetizer of your choice with the purchase of two meals. Valid for up to 3 Free Appetizers per visit. Cozmic Charleys Discount: 20% discount on your entire check. Dairy Queen Discount: Buy any burger, hot dog, chicken or iron grilled sandwich and get a second for free; Buy any Blizzard and get a second for free. Damons Grill Myrtle Beach Discount: Get your choice of an Onion Loaf Sampler or Spinach Artichoke Dip with the purchase of an entree or get a 10% discount on all food if seated before 5:00 p.m.
Damons Grill North Myrtle Beach Discount: Get your choice of an Onion Loaf Sampler or Spinach Artichoke Dip with the purchase of an entree or get a 10% discount on all food if seated before 5:00 p.m.
Derbsters Discount: The cardholder and up to one guest will each receive their choice of the following with purchase of a dinner entree and a beverage: 1/8 nachos, small chili cheese fries, small ranch cheese fries, or sub roll cheese pizza. Driftwood's Seafood and Steak Discount: 20% discount on food items. Valid for the cardholder and up to 3 guests. Duffy Street Seafood Shack Cherry Grove Discount: Buy one Captains Platter, get a second one half price. Duffy Street Seafood Shack Myrtle Beach Discount: Buy one Captains Platter, get a second one half price. Duffy Street Seafood Shack North Myrtle Beach Discount: Buy one Captains Platter, get a second one half price. Empire Fire Discount: 15% discount on lunch; 20% discount on dinner. Fat Jack's - Order any food item and get the 2nd of equal or lesser value for Half Price. Filet's on the Waterfront Discount: Order two entrees and get a pound of crab legs free (1/2 pound during June, July, and August). Valid for your entire group. Finocchio's Italian Restaurant Discount: 10% discount on all food purchases. Fox's Pizza Den (surfside): Buy a 6 1/2in. Hoagie and get a 2nd one Free. Froyoz Frozen Yogurt Discount: Buy one frozen yogurt, get one free. Fuddruckers: Buy a 1/3 Burger and get a 2nd Free with the purchase of 2 drinks. Gem City Pizza: Buy 1 Pizza and get a 2nd for 50% Off or 15% Off your check. George's Pancake House: Receive 10% Off your Check (cash only). Greg Norman's Australian Grille Discount: Buy one lunch, get one half price. Not valid on holidays. Gregs Cabana Bar & Grill Discount: Buy any menu item (excluding appetizer's or specials) at the regular price, get the second for half price. Hamburger International: 20% Off your check. Hwy 55 Burgers (Myrtle Beach): Buy one Blue Plate Special, get the second for half price. Hwy 55 Burgers (Murrells Inlet): Buy any Andy's Burger and get a Free Cheeseburger. Indo Thai Myrtle Beach Discount: Buy one hibachi dinner, get second for half price; Buy any two dinner entrees and get a free appetizer (up to $7.99). Not to be combined with any other offer and not valid for lunch, happy hour, or specials. Indo Thai Pawleys Island Discount: Buy one hibachi dinner, get second for half price; Buy any two dinner entrees and get a free appetizer (up to $7.99). Not to be combined with any other offer and not valid for lunch, happy hour, or specials. Island Bar and Grill Pawleys Island Discount: buy a lunch or dinner at regular price, get a second for half price. Jersey Mikes: Buy one regular sub with chips and drink, get one regular sub free. Joey Doggs Discount: 20% discount on your entire check. Kansas City Steakhouse Discount: Buy a fish or chicken meal and get a second for half price. Kobe Express Discount: 10% off lunch; 15% off dinner. Excludes specials. Litchfield Beach Fish House Discount: Buy one Entree and get one of equal or lesser value for Half Price. Not to be combined with specials. Litchfield Restaurant Discount: 10% discount on your check (cannot combine with specials). Locals Corner Restaurant and Bar Discount: 15% discount on food items. Longbeards Bar & Grill Discount: Buy one sandwich, get a 2nd of equal or lesser value at Half Price. Lucky's Pizza: Buy 1 Pizza and get a 2nd of equal or lesser value at Half Price or 20% off your check. Luigi's At 61st Discount: $5 off any good purchase over $20; $10 off any food purchase over $40. Not valid on Early Bird or Daily Specials. Lulu's Cafe Discount: Buy one menu item, get the second for free (except for June, July, & August); Buy one menu item, get the second for half price (June, July, & August). Midtown Bistro: $2 off dinner entrees, not to be combined with any other offers, specials or on Holidays. Valid for the Card-holder and all on the same check. Milardo's Pizza - 10% off Entire Check, Alcohol included. Murphy's Law Sports and Raw Bar (Myrtle Beach): Buy 10 Wings and get 5 Free, not valid for Happy Hour pricing nor Take-out. 15% Off Burgers and Sandwiches not valid June, July and August. Minimum of 1 Beverage per person required. Valid for the Card-holder only. New China Buffet: September 2013 - May 2015: Buy one Dinner Buffet and get the 2nd Half Price. June 2015 - August 2015: Buy 2 or more Dinner Buffets and get $5 off September 2015 - December 2015: Buy one Dinner Buffet and get the 2nd Half Price. Nick's New York Pub: Free 1/2 lb Nick's Burger with the purchase of a Nick's Burger and 2 beverages. Niki's Bar & Grill: Buy one quesadilla, sandwich, salad, or entree, get a second for free. Orange Julius: Buy an Orange Julius Original or Premium Fruit Smoothie and get the 2nd of equal or lesser value Free. Outer Limits Family Restaurant: Buy 1 Lunch and Receive the 2nd of Equal or Lesser Value for Half Price. Overtime Sports Cafe - $10 off any check over $40 not including tax or gratuity. Pink Pineapple Bakery & Cafe: Buy one sandwich and get a 2nd sandwich of equal of lesser value at Half Price. Limit to one half price sandwich per day per card holder. Pizza Inn: Buy 1 Large Pizza at Menu Price get 2nd of Equal or Lesser Value Free or 2 Buffets and 2 Drinks for $13.99. Prince Creek Diner: Buy 1 dinner from our home-style favorites menu and get a 2nd of equal or lesser value for Half Price. Remedies Bar & Grill: Receive 20% Off your entire check. Rodeo Bar & Grill Restaurant Discount: Free appetizer with any entree purchase (One free app per card). Rotelli Pizza & Pasta: Buy 1 Dinner Entree Get the 2nd of Equal or Lesser value for Half Price Buy 1 Large Pizza Get the 2nd pizza of Equal or Lesser value for only $7. Secret Chef Cafe: Buy any breakfast sandwich and get a 2nd for half price. Get 1 half price dessert with a delivery lunch order. Senor Frogs Discount: Free Chef's Nachos with the purchase of any entree (Limit One per table of 4); No Cover for 21 years of age or older. Half price cover for under 21. Valid for the cardholder and 1 guest before 11:00 p.m. Not valid for special events. Smokehouse Billiards: Buy one menu item, get one free. Valid for the entire group. Snooky's: Buy 1 Entree and get the 2nd of equal or lesser value Free, up to $15 off. Socastee Station Discount: Buy one lunch or dinner, get one half price. Soho Cafe Myrtle Beach Discount: Buy one hibachi meal, get one for half price. South Beach Creamery - Buy one get one at Half Price valid for the Card-holder and up to 3 Guests. Southside Patty's Discount: Buy one menu item, get a second menu item for half price (minimum purchase of two beverages required). Sugami Discount: Buy one hibachi meal, get one for half price. Three Guys Subs and Pies: Buy 1 Pizza Pie and get a 2nd of equal or lesser value Free. Buy 1 Sub Sandwich and get the 2nd of equal or lesser value Free. Tropical Smoothie: Buy any Wrap, Sandwich or Salad and get a Smoothie at Half Price. Buy any Wrap, Sandwich or Salad and get the Second of equal or lesser value at Half Price. Villa Romana: $10 discount on two or more entrees. Azalea Sands Golf Club Discount: March-April ($45); May-September ($35); October and November ($45);December ($35). Rates are valid for the card-holder and up to 3 Guests. Tee times may be made up to 7 days in advance. Beachwood Golf Club Discount: March, April, and October ($45); All other months ($35).Rates are valid for the cardholder and up to 3 guests. Tee times may be made up to 7 days in advance. Brunswick Golf Plantation Discount: Play 18 Holes for $35 (except for March & April, which is $45). Offer is good for the cardholder and up to 3 guests. Tee times must be made within 48 hours. Carolina Shores Golf Club Discount: $30 through December (except for March, April, May, and October, which is$35). Tee times may be made up to 48 hours in advance. Rates are good for the cardholder and up to 3 guests. Conway Country Club Discount: 18 Holes w/Cart and taxes ($20); 18 Holes walking w/taxes ($14). Valid for the cardholder and up to 3 Guests. Crow Creek Golf Course Discount: Play 18 Holes for $37. Offer is good for the cardholder and up to 3 Guests. Tee times must be made within 48. Cypress Bay Golf Discount: Dec 2012 - Jan 2013 ($28); February ($30); March & April ($36); May thru September ($28); October & November ($34): December ($28). Tee times must be made within 48 hours. Farmstead Golf Links Discount: Bring in the Myrtle Beach Discount Card for a rate of only $44. Tee times must be made within 48 hours to receive this rate. Valid for entire foursome. Harbour View Golf Discount: Buy one 18 hole round with cart, get one free (excludes July and August); Buy one 18 hole round with cart, get one half price during July and August; Get $1 off a large bucket of driving range balls. These offers are valid for the cardholder and up to 3 guests. Heron Point Golf Club Discount: January-February ($35); March-April ($45); May-September ($35); October-November ($45); December ($35). These rates are valid for the cardholder and up to 3 guests. Tee times may be made up to 7 days in advance. Indigo Creek Golf Discount: January-February ($35); March-April ($45); May-September ($35); October-November ($45); December ($35). These rates are valid for the cardholder and up to 3 guests. Tee times may be made up to 7 days in advance. Meadowlands Golf Club Discount: Bring in this card for a rate of only $39. Tee times must be made within 48 hours to receive this rate. Valid for entire foursome. Palmetto Greens Golf Discount: $30 with the exception of March, April, May, and October ($35). Tee times may be made up to 48 hours in advance. Rates are good for the cardholder and up to 3 Guests. River Oaks Golf Discount: January-February ($35); March-April ($45); May-September ($35); October-November ($45); December ($35). These rates are valid for the cardholder and up to 3 guests. Tee times may be made up to 7 days in advance. Rivers Edge Golf Discount: January-February ($60); March-April ($75); May-September ($60); October-November ($75); December ($60). These rates are valid for the cardholder and up to 3 guests. Tee times may be made up to 7 days in advance. Sea Trail Golf Plantation Discount: Play 18 Holes anytime during 2013 except March, April, May, October, and November for $35. 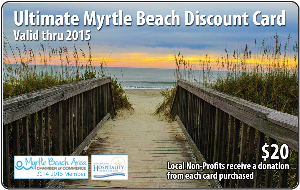 This is a special offer for locals with proof of NC or SC residency and you must have the MBP Discount Card. Offer is good for the cardholder and up to 3 Guests. Tee times must be made within 48. Shaftesbury Glen Golf & Fish Club Discount: $20 off the going rate. Tee times made be made up to 48 hours in advance. Valid for the cardholder and up to 3 guests. The Pearl Golf Links Discount: Play 18 Holes for$49. Includes cart and taxes. Offer is good for the cardholder and up to 3 guests. Tee times must be made within 48 hours. The Valley at Eastport Golf Club Discount: Buy one get one 1/2 off the standard rate. Valid for 2-4 players. Tupelo Bay Discount: Buy one 18 hole round with cart and get one free (not valid with any other offers or during July and August): July and August - Buy one 18 hole round with cart and get one at half price (not to be combined with any other offer); Get $1 off a large bucket of driving range balls. All offers are valid for the card-holder and up to 3 guests. Wedgefield Plantation Golf Discount: $28 with the exception of March, April, May, October, & November ($38). This discount is good for the cardholder and up to 3 guests. Tee times must be made with 48 hours. Whispering Pines Golf Discount: March, April, and October ($43); All Other Months ($37). Valid for the card-holder and up to 3 Guests. Wicked Stick Golf Discount: $20 Off the going rate. Tee times made be made up to 48 hours in advance. Valid for the Card-holder and up to 3 Guests. Big Laughs Theatre Discount: Buy one ticket get one half price. Valid for the Card-holder and up to 5 Guests. Not valid for VIP Seating and can't be combined with any other. Carolina Improv Discount: Buy one ticket get second ticket at hal fprice. Valid for a total two discounted tickets. Not valid with other discounts, promotions or online. Valid only for one show on double feature show nights. Must be purchased at door on the night of the show. Subject to availability. Celebrations Nitelife Discount: Free admission to Celebrations Nitelife for the cardholder and one guest; Large one-topping pizza only $10 with the card at Broadway Louie's (dine in only). Comedy Cabana Discount: Buy one regular admission, get one half price. Not valid on Saturdays or for special events. Good for the cardholder and 1 guest. Night Fever Retro Party Club Discount: Free admission for the cardholder and 1 guest OR Buy one menu item, get a second menu item free. Rodeo Bar & Grill Discount: Free admission for the cardholder and 1 guest. Senor Frogs Night Life Discount: No cover charge for the cardholder and a guest over 21 before 11:00 p.m.; under 21 gets in at half price. Not valid for special events. The Bowery Discount: Free admission for the cardholder and up to 3 guests AND get 10% off souvenirs.